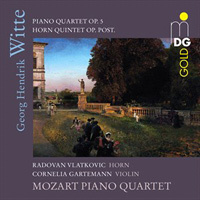 GEORG HENDRIK WITTE (1843-1929): Piano Quintet in A, Op. 5, Horn Quintet. Description: Music director of the city of Essen for 40 years and longtime correspondant with Brahms, Reger, R. Strauss, Mahler, Joachim and Schillings, Witte did most of his composition before 1871. The four-movement, 38-minute piano quartet was published as early as 1867 and sonuds as much like Schumann as Herzogenberg’s music sounds like Brahms; the horn quintet is also from the same period and its influence is closer to Brahms. Fine examples of high-period Romanticism. Mozart Piano Quartet w/Radovan Vlatkovic (horn) and Cornelia Gartemann (violin).